Toolsbuff.com offers you this quick solution to become table one compliant under the new OSHA Silica dust regulations, you can get everything you need to do Surfacing on concrete with this bundle. 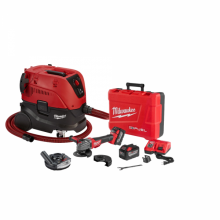 It includes the 8960-20 8 Gallon Dust Extractor, the 49-40-6101 surface grinding shroud and the 2783-22HD M18 Fuel High Demand 4-1/2 to 5" Braking Grinder Kit. Click the button below to add the Milwaukee 8960-20 With 49-40-6101 & 2783-22HD 8 Gallon Dust Extractor Silica OSHA Starter Kit - Surfacing to your wish list.